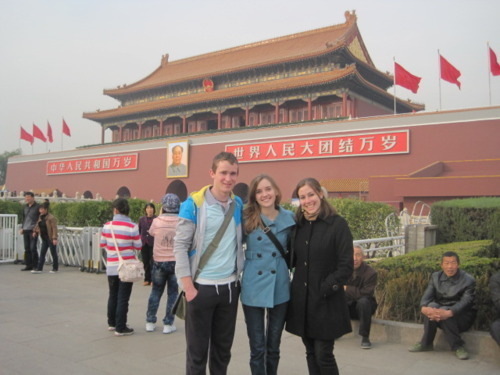 My sight-seeing started with a grey, chilly afternoon at Tiananmen Square and the Forbidden City with Quint and James. The old city goes on forever, and each building you pass through opens up into an even larger space. In a city as crowded and hectic as Beijing, the wide open courts of the palace demand your attention. There is so much space! And everything is lined up so precisely, designed so specifically, decorated so intricately. After we had walked the main path, we diverged onto the side wings, and it turned into the best part of exploring the Forbidden City. We found a deserted maze of ancient buildings, quiet and cold, and made guesses at what officials, courtiers, artisans, servants, and concubines had wandered the long walkways centuries ago. 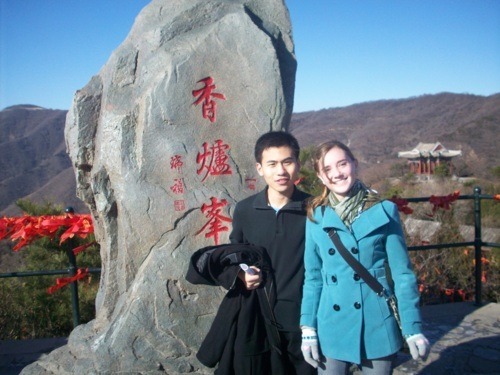 My next sight-seeing trip was to the Fragrant Hills with my Chinese friend, Wu Di. The Fragrant Hills are up in the mountains just outside of Beijing, and they were once part of the imperial gardens. When Mao Zedong was trying to establish the Communist Party in China he used the mountains as a hiding place and as a strategic vantage point to coordinate and plan. We went early on a Saturday morning; I had to be home by about noon in order to get ready for work that afternoon, so we were in a bit of a hurry. Wu Di goes to the Fragrant Hills every weekend to run up the mountain side to the highest point. I swear on my life, I thought I was going to be sick. It was a pretty good indication that I need to start working out more. Wu Di was fine of course, because he runs there all the time. I, on the other hand, was wobbly and gasping for breath at about the half way point. I already get plenty of attention from the locals without adding a splotchy red face, haggard breathing, and sweaty hair plastered to my forehead. Let me tell you, it was attractive. But— we made it to the top of the never-ending staircase! And the view from the top was pretty amazing. You could see almost all of Beijing, plus the surrounding countryside. We didn’t enjoy it for too long before we had to hurry back down so I could go to work. During the spring I would imagine that the Fragrant Hills are spectacular, and I would definitely recommend a day trip. Just… don’t try to hurry up the hill, take the slower meandering path (not the straight-shot staircase), and enjoy your time there! James and I headed back out for some more tourist spots later in the month, and we made a day of it. 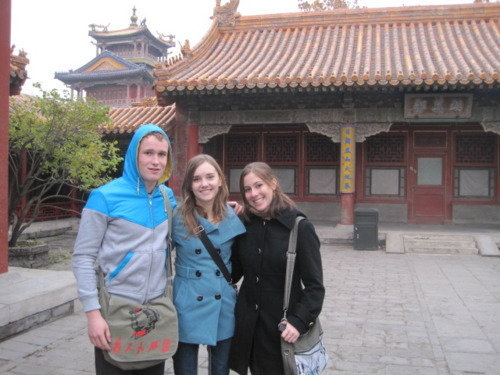 First we went to Lama Temple, an old Buddhist temple in the heart of Beijing. It was a perfect day, the sun was out and the sky was clear (something you learn to appreciate in Beijing very quickly), and the temple had rows of golden-leafed trees that let those leaves fall like water-drops. The air smelled like incense and quiet people whispered prayers with bowed heads. We explored the many shrines to different deities, some fiercesome, some gentle. Monks watched their sacred buildings, answered questions for the curious, or offered advice to the reverent. It was beautiful. Our next stop that day was the Olympic Park, the location of the 2008 summer Olympics. We weren’t sure how to get to the park from the subway stop, so we hopped into a modern-day rickshaw and got a ride there. We were immediately bombarded by Chinese people selling a ridiculous assortment of souvenirs. We did get talked into buying a couple of kites. 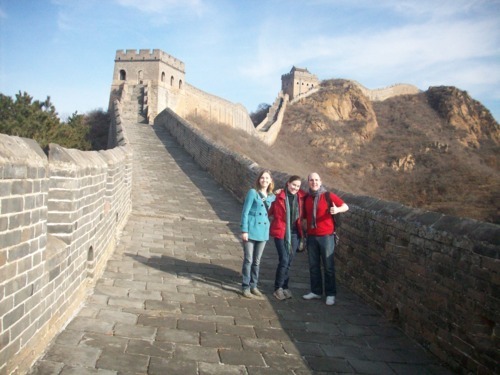 My next stop: The Great Wall! Quint, Mark and I picked a beautiful Sunday and did a day trip out to the Wall. We had to get up bright and early, and got on a bus for about an hour and a half. We made friends with a friendly Chinese woman who helped us find the right stop, and when we got off the bus she made sure the taxi driver didn’t try to rip us off. Our driver took us another hour and a half out to a more remote part of the wall, then went to wait for us a few miles further along so we could meet him there and get a ride back into town. The wall was spectacular. Quint had mentioned in the bus, “I hope this part of the wall is a good section” and Mark had quite succinctly replied, “It’s the Great Wall! It’s a wall, that’s great!” And it was. It took us about three hours and we covered about that many miles. Some sections of the wall were perfectly preserved, while others looked like they might crumble beneath your feet if you weren’t careful. The winding portions of the wall were marked by towers, where Chinese men and women sat with bottles of water and snacks for the tourists that eventually made their way along the steep and uneven steps and paths. We had a great day; Mark is training for a marathon, so kept speeding ahead and doubling back, while Quint and I hung back and chatted, enjoying the view, but occasionally hurrying to catch up with him. Yesterday I did my last day of sight-seeing, this time with James and our friend Nial. 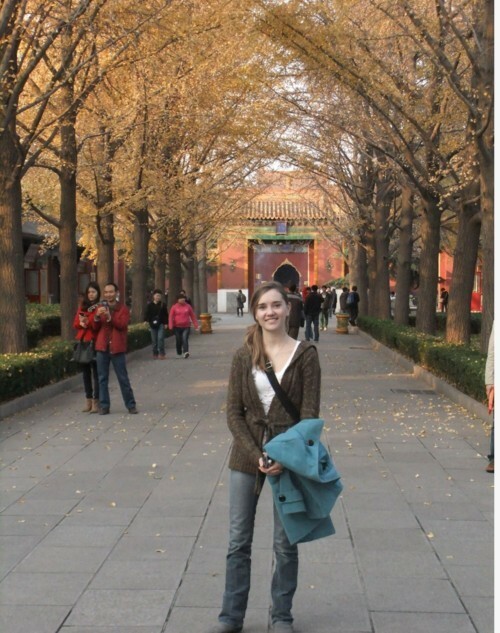 We went to the Temple of Heaven. This temple is Taoist, and is surrounded by seemingly endless parks; the main structure is a beautiful circular building that stands alone reaching towards the sky. We wandered around the grounds, took a lot of pictures, bought some souvenirs from a street peddler, and enjoyed the afternoon. From there we went for some McDonald’s (embarrassingly enough— our second of the day… I eat so much more McDonald’s here than I ever do at home! ), then headed to the Silk Market. The Silk Market is one of the main black markets, and is just a mess of stores, shops, people, junk, noise, frustration, and yelling. People argue over prices and do everything they can to get the price just a little bit better for their side of the deal. I’m a terrible bargainer, but luckily James and Nial are good at it. They saved me a lot of money on Christmas presents. But now that my shopping is done, I have no intention of going back! All in all, it was a good month in China.